September 2016 | It`s full of stars! After enabling OCB features, you should check if folders and files are correctly available in SMP3. 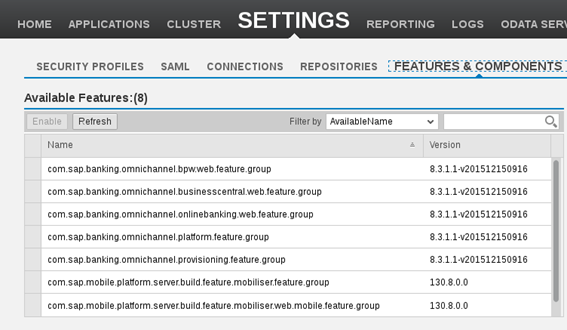 In theory, the enablement worked, when OCB files are available in the features, plugins and webapp folder of SMP3. ls /SAP/MobilePlatform3/Server/features/ | grep "com.sap.banking.omnichannel*"
You should get a list of 5 folders. ls /SAP/MobilePlatform3/Server/plugins | grep "com.sap.banking"
Three banking-* folders must exist. While installing OCB, SMP3 had to be stopped. During the installation, the database was prepared and files that represent the OCB application were copied to SMP3. Those bundles are now available in SMP3 (OSGI bundles), but are not activated. To be able to use OCB, the features must be activated by SMP3 administration in the Admin web interface. First, start SMP3. After adding the p2 repository containing the OCB features, you can enable them. Navigate to Settings -> Features & Components. The screen shows the available features for SMP3. With adding the OCB p2 repository, the OCB features are listed. You have to follow a specific order when activating the features. SMP3 server will restart. You can see this on the console. New bundles and new features are being started. SMP3 server must start successfully. If not, you have a problem. Download the installation file from SAP Market place and copy it on the SMP3 server. This will give you the installation files in the folder. The installer is the folder SAPOnlineRetailBanking8.3.1.1. Press enter to start the wizard. You’ll have to inform several paramters, like SMP3, Database, etc. 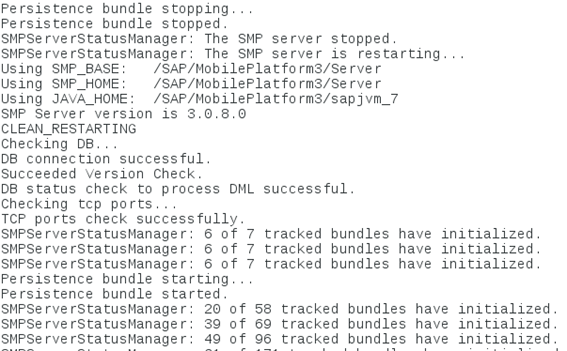 To be able to install SAP Omnichannel retail banking on SMP3 SP8, some adjustments must be done on the SMP3 server configuration. 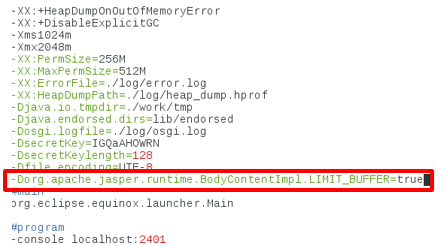 Add a new parameter in the props.ini file of SMP3 server. 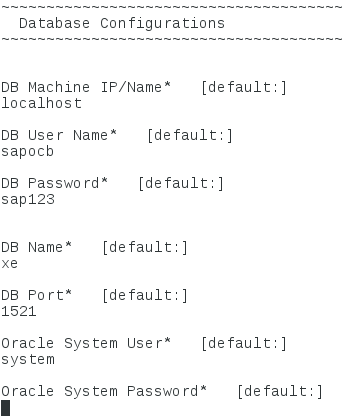 Looking at the installation guide from SAP, this configuration is somewhat against SAP’s own security recommendations, but is needed as OCB uses struts, and for those the validation must be done via DTD and not by XSD. Edit the file fixed-sys.properties located at /SAP/MobilePlatform3/Server/configuration/com.sap.mobile.server.launcher. Comment out the last two properties. New browser don’t like anymore the SMP3 SP8 standard TLS ciphers, therefore these must be changed to be more aligned with latest security expectations. For each TLS connector, substitute the ciphers by TLS_ECDHE_RSA_WITH_AES_128_CBC_SHA256,TLS_ECDHE_RSA_WITH_AES_128_CBC_SHA, TLS_ECDHE_RSA_WITH_AES_256_CBC_SHA384, TLS_ECDHE_RSA_WITH_AES_256_CBC_SHA,TLS_RSA_WITH_AES_128_CBC_SHA256, TLS_RSA_WITH_AES_128_CBC_SHA,TLS_RSA_WITH_AES_256_CBC_SHA256,TLS_RSA_WITH_AES_256_CBC_SHA. Set JAVA_HOME variable to the one used by SMP3.